If someone hands you this business card, you know immediately that the word ‘humility’ is not in his lexicon. 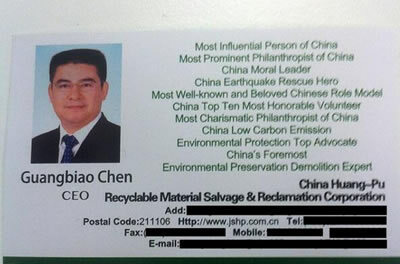 It reads: ‘The most influential person of China’, ‘Most charismatic philanthropist of China’, ‘China moral leader’, ‘Most well-known and beloved Chinese role model’, ‘China earthquake rescue hero’, and, clearly his day job, ‘China’s foremost environmental preservation demolition expert”. So not someone to be messed with. This card belongs to a potential purchaser of The New York Times, so the American media were quick to find out more about him. Such a surreal presentation would bring a smile if it did not bear the name of a candidate vying to become one of the leading media owners in the world. It is – as Americans would say – a no-brainer to suggest that Chen Guangbiao is an original. Well-known for his eccentricity, Chen Guangbio was once a pioneer in the recycling sector. Green in spirit (and wallet) he made his fortune safeguarding the environment and wears clothes that are apple-green. He is also a philanthropist. For example, he was seen handing out ‘pure air cans’ in several polluted cities and donated 1,000 duvets, 500 torches, a ton of bread and 200 yuan (€25) to all the inhabitants of Ya’an, which was hit hard by an earthquake last year. 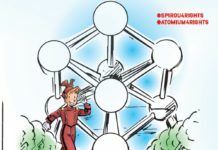 Presumably an icon in his own country, he seems determined to get his hands on a prestigious U.S. newspaper for the modest sum of €1bn. He may soon be adding “Most prominent patron of the western world” to his resumé.